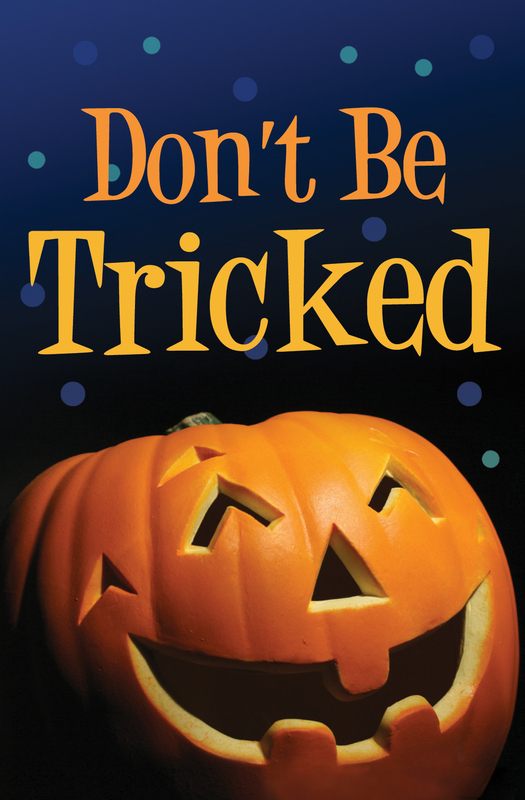 This Halloween tract warns children not to be tricked by the lies of the world, but to listen to the truths found in the Bible. But when God’s son, Jesus Christ, came to earth to live he said, “Let the children come to me and do not hinder them” (Matthew 19:13). Jesus loves kids and wants them to know him and his Father! But the Bible says that Jesus, God’s Son, is the ONLY way you can ever know God. Jesus said, “I am the way, and the truth, and the life. No one comes to the Father except through me” (John 14:6). But listen to what Jesus said about those who believe in him, “I came that they may have life and have it abundantly” (John 10:10). “Boring” isn’t something Jesus ever had in mind for those who believe in him. God and his Son Jesus love us. “God shows his love for us in that while we were still sinners, Christ died for us (Romans 5:8). That’s real love, to die to save someone else’s life! But why would Jesus have to die for us? Because he knew that the bad things we do—things like selfishness, lies, hatred, and disobedience—are the reasons we aren’t automatically part of God’s family. God calls those sins and he says sins have very serious consequences: “the wages of sin is [eternal] death” (Romans 6:23). That means being separated from God forever. Remember how Jesus loved kids when he was on earth? It makes sense that he would make a way for kids—and adults too—to have their sins forgiven and someday go to heaven. Here’s how he did it. He became a human like us, lived a perfect life, then he took God’s punishment for our sins by dying on the cross! That’s right, he “suffered once for sins…that he might bring us to God” (1 Peter 3:18). Then Jesus came back to life, proving that God had accepted his substitution for us! Those who truly believe Jesus died in their place receive God’s forgiveness of sin and become part of God’s family. “To all…who believed in his name, he gave the right to become children of God” (John 1:12). God promises them a home in heaven after this life. Jesus said, “I give them eternal life, and they shall never perish” (John 10:28)!